They are women a lot like you who come from diverse backgrounds and hold a variety of interests. Their common bond is their lineal descent from patriots of the American Revolution. Any woman, regardless of race, religion or ethnic background, who can prove this lineage is eligible to join. An applicant for membership must be no less than 18 years of age. She shall prove lineal bloodline descent from an ancestor who aided in achieving American independence during the Revolutionary War period of 1775-1783. If you are interested in membership, please contact a local chapter and arrange to attend a meeting, after which you can begin working with the DAR Application Worksheet. Each chapter has a registrar who can give guidance. Furthermore, some registrars may have the application program on their home computers and be able to work with you on a one-to-one basis as the necessary data and documentation is obtained, thus making the application process easier. Lineal proof starts with your birth certificate naming your parents and continues with proof of some sort back to your patriot ancestor. Many applicants need only to prove the lineage to where they can connect with a DAR member who has used the same line and provided satisfactory proof. Some prospective members may find, however, that more exact proof of lineage and patriotic service is required than what was provided in the past. Today's resources and tools provide more accessible and precise genealogy, and as a result, the Genealogical Research System is regularly updated with corrections, as well as "new" patriots. How many possible patriot ancestors do you have in your family? Since the number of your ancestors double each generation as you go back, you could have several patriots, depending on your age and how many lines go back to the colonial period. INTERESTED IN LEARNING MORE ABOUT DAR MEMBERSHIP? Contact your local chapter. They are listed on the menu under the Chapter tab, or you can learn about becoming a member by going to: NSDAR. 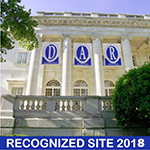 DAR members across the country have annually assisted the genealogical research of others by carefully copying and preserving unpublished records. In this state alone, members have contributed material to fill over 120 large Genealogical Records Collection (GRC) books. Copies of the Washington State GRC books can be found in the DAR Library in Washington, DC, Seattle Public Library (ask for them at the counter), Spokane Public Library, University of Washington Library, Washington State Library (Olympia), DAR State Library Collection (Yakima), Seattle Genealogical Society Research Center, and the Senior Center on Sidney Ave in Port Orchard. Some locations have only a partial collection. GRC books contain a variety of birth, death, and marriage records compiled from pioneer newspapers, family histories, records from cemeteries and mortuaries, census records, Bible records, and more. An every-name index of the Washington State GRC books has been completed. This index is available at the DAR Library. 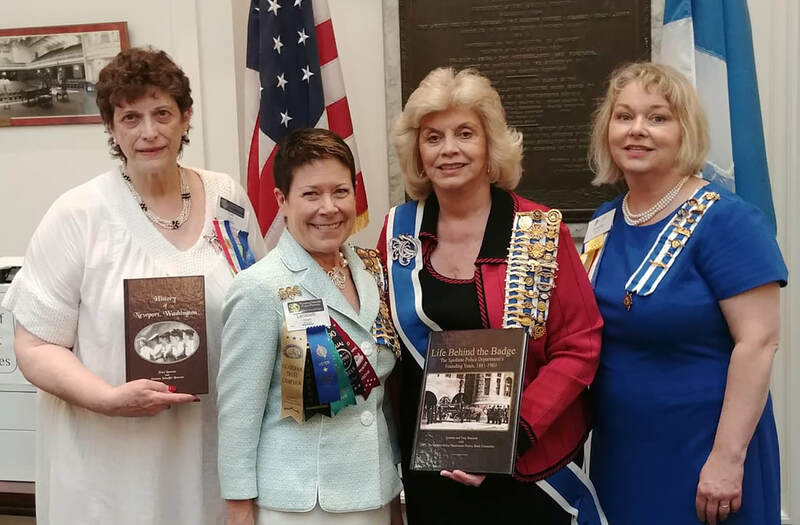 A Century of Service, The Story of the DAR - This book describes how our organization began, how it functions, and lists some of its accomplishments. It also tells about a few of its more famous members. Four of them are: Dr. Mary Edwards Walker, a Civil War physician and surgeon; Rear Admiral Grace Hopper, who retired from the United States Navy in 1984 at the age of 79; Dr. Margaret Rhea Seddon, the astronaut who carried a DAR Insignia aboard the space shuttle "Discovery" on April 12-19, 1985; and Grandma Moses, the artist. Black Courage 1775-1783 - Documentation of Black Participation in the American Revolution, by Robert Ewell Greene, 1984. DAR Library Catalog, 3 Volumes - The DAR Library contains over 115,000 volumes and tens of thousands of files of genealogical material. About two-thirds of the books are local history and record abstracts and one-third are family histories and genealogies. Included are unpublished Bible records and cemetery, marriage, and other vital and genealogical records collected from all over the country by DAR members. In addition to the printed version of the catalog, there is now a searchable online catalog available. The content contained herein does not necessarily represent the position of the NSDAR. Web hyperlinks to non-DAR sites are not the responsibility of the NSDAR, the state organizations, or individual DAR chapters. Contact the webmaster | This site last updated May 11, 2018.